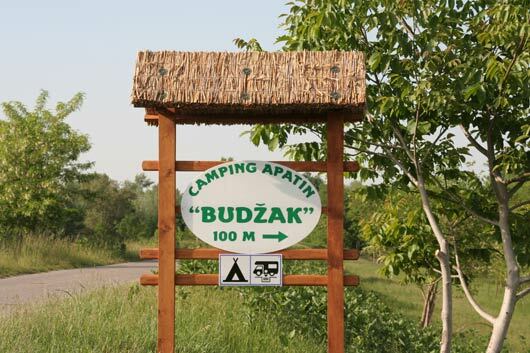 Special Nature Reserve "Gornje podunavlje"
Camping Apatin is located in the direct vicinity of the Danube, 100 m from the famous Danube cycle path, running from Germany all the way to the Black Sea. 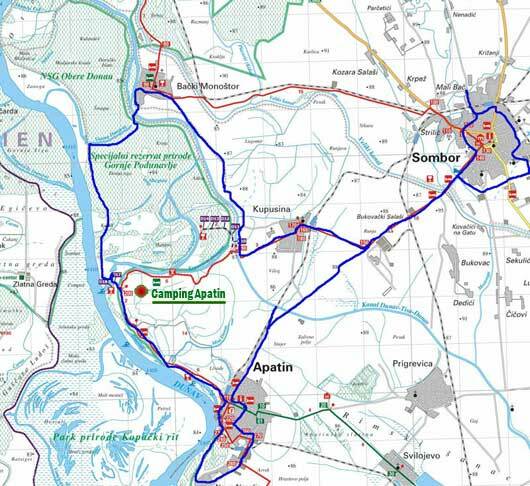 It is 8 km from the town of Apatin. There are ample opportunities for walking, fishing, boating (boats can be rented 1 km from the campsite), you can visit chardas with good food and towns in the surrounding. 15 good-sized (90 – 100 m2) flat and separated plots are covered in grass. One half of them are in the sun, and the other half in the shade of walnut trees. It is surrounded by a fence, there is water and electricity (10 A) supply and a sanitary block with heated water, showers, toilets and washing up facilities. There is grey and black water disposal point. On hot days you can enjoy the swimming pool (18m2). Refreshments are available on a nice terrace, in the shade of a 100-year-old cherry tree. If it happens to rain or it is cold, you are welcome indoors. The reception is open every evening from 18.00 to 21.00. When you come to the town of Apatin, follow the signs for marina and filling station in the marina and football stadium. Then drive past the marina, shipyards, restaurant "Plava ruža" and along a narrow asphalt road for about 4 km. You will see the sign for the campsite on the right. Copyright © 2008-2018 Camping-Apatin. All rights reserved.